For sure, as JMD underscores h e r e, it was the New York Times' correspondent who had requested for the exclusive interview with the Tun, for the reverse (i.e Dr Mahathir Mohamad requesting for the NYT to interview him) would be simply unthinkable! But I would still have questioned the timing the NYT chose to publish the article. They know very well that we are "an officially-Muslim country" and they decided to publish the piece on the eve of our holiest month Ramadan. It's an editorial act, I must say, verging on the malice. JMD may not agree but I grew up as a journalist during Dr M's era, when we were taught to view foreign media with the greatest suspicion. Anwar Ibrahim, for example, was the darling of the foreign media when he was the Deputy Prime Minister (and I doubt he had to pay a single sen to any of them, either) and weren't we right to be suspicioius of him? 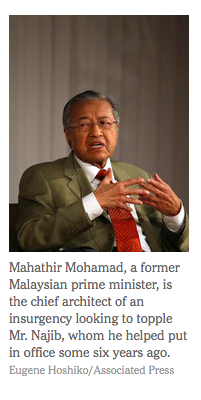 So the NYT got what it wanted, and Tun got to rehash what he'd been saying. So on the first day of holy Ramadan, PM Najib Razak got accused of doing things "verging on criminal" (not exactly as a criminal yet, Salleh Syed Keruak please note, but close and still is the darndest accusation made thus far by the Old Man). And the ghost of Altantuya is ressurrected once again, and Rosmah Mansor "projects herself too much" again, etc etc. But there goes our hope for a holy ceasefire. p.s. For the record, I've never heard Anifah Aman speak ill of Dr M. His open letter to the NYT, in response to the article by the NYT based on the exclusive interview with Dr M that was sprinkled with quotes by others, including Rafizi Ramli (see end notes again), stems from genuine regret, I'm sure. Perhaps because the NYT article was published, coincidentally of course, on the day Malaysia was to chair the United Nations Security Council meeting. If he thought NYT was out to embarrass Malaysia on the occasion, can I blame him? 1. It is regrettable to see Tun Mahathir seeking to undermine his own country in the international media as part of a personal political vendetta. 2. It is irresponsible of any citizen, let alone a former prime minister, to spread lies and distortions about state owned companies – saying for example that RM42 bn is missing from 1MDB to create public anxiety, when in fact these are audited debts backed by RM51 bn assets. These reckless claims have affected market sentiment towards Malaysia. 3. Furthermore, it is telling that he continues to mount his attacks, rather than wait for the findings of the enquiries currently being undertaken by Malaysia’s central bank, Auditor General, and parliament’s bipartisan Public Accounts Committee. This shows that Tun Mahathir is not interested in answers from the appropriate lawful authorities. Rather, he is just using 1MDB as an excuse to topple the serving prime minister, Najib Tun Razak. 4. And all because his personal demands, as Tun Mahathir himself has acknowledged, are not being met. Prime Minister Najib, as Malaysia’s democratically elected leader, will do what he thinks is right for the nation, and will not allow rule by proxy. 7. But Tun Mahathir is abusing that freedom, and his privileged standing as a former prime minister, to indulge in reckless and baseless personal smears against Prime Minister Najib and his family. Most Malaysians would rather see Tun Mahathir retire gracefully than continue to damage the standing of his own country for personal political gain. This country claims that the Rohingya are not their people. They’ve been there for 800 years, much longer than the Chinese in Malaysia. The atrocities committed are terrible. They killed and burned people, they beat people to death. In this day and age, people should not behave like that. Asean [the Association of Southeast Asian Nations] should do something. If necessary, I think I would expel this country. It’s terrible. The whole world should boycott this country. Rafizi: We've been at 1MDB for FIVE years lah! Thomas Fuller reported from Putrajaya, and Louise Story from New York. The whole world needs to know that Malaysia is being managed by a bunch of crooks that steals lollipops from children ! What is so bad about exposing the mismanagement of the country's finances, and trying to hide things from the people ? Holy month is only for the faithful and those who are not hypocrites. "But I would still have questioned the timing the NYT chose to publish the article. They know very well that we are "an officially-Muslim country" and they decided to publish the piece on the eve of our holiest month Ramadan. It's an editorial act, I must say, verging on the malice." With all due respect Latuk, I think you may be over-thinking this. The matsal simply do not care about our religious observances. I think it's simply that it never even crossed their minds. That seems to be a more likely scenario, to me. You mean during Ramadan there are no crooks ? All investigations cease ? Can enjoy with Paris Hilton ? Now your masters problems are part of a global Jewish conspiracy ? But I think the spat between them if they want to continue it, let it be among themselves i.e let PM Najib replies to the latest salvo by Tun by himself. Others should just step back and not pour the oil on the fire. Nonetheless, Najib Governemnt still needs to be brought down for the sheer arrogance of it all. Rafizi has been playing it for the past 5 years publicly while Tun was doing it privately. That is what Rafizi not aware of. Rafizi only gained small momentum eventhou struggling for years while Tun only took it weeks, enough to force PM to use all the necessary TV3, Bad Mouth Proton, Lim Kok Wing, use SPRM advisor (big mistake by PM), use CheguBard (hidup dlm buangan), and what not to fight Tun. PM has nothing to fear with Rafizi at all in fact, almost everyday Rafizi talking about 1mdb, be it at Sogo, Masjid Negara, ceramah or in Parliment itself, it is still a business as usual to PM's daily life. No harm. While Tun does not need all those Rafizi's style. Tun only writes, talking about the same issues like Rafizi does and PM got a very serious panic. Can you see the differ of 22years Prime Minister's say against newcomer MP so called strategist.? Whatever are revealed by all parties one thing for sure all the dirty lenient revealed thus far are from Umno. How often do the Umno schmucks do that ? It is What you see thus far are only the 'starters' just you wait and see what more will be revealed when the fights go on. Ramadhan bukan satu bulan untuk diperguna dan diperalatkan untuk melindung diri menghalalkan cara dan niat yang salah sebelumnya. Jika Ramadhan dihormati kenapa Anifah bukan sekadar menghantar surat terbuka dan penafian tetapi mengambil kesempatan memburukkan Mahathir. Kenapa tidak secara bijak Anifah menghantar surat bantahan dan nyatakan bahawa jawapan penuh akan dibuat selepas Ramadhan bagi mengjormati bulan tersebut. Bukankah itu tindakan yang lebih beradab. "But then Myanmar is America's latest sweetheart in this region, so I won't expect NYT to follow through. In fact, I was surprised the quotes made the article"
Sorry lah Rocky, the NYT is not like the newspapers you worked for and support. They aren't controlled and don't take orders from the government. No need to be surprised lah. That ius what is called a free press. "I think it was the plan from the start, to help the Opposition reclaim credit for 1MDB"
Hai, Rocky you sound like your own citique of Pakatan and the Judiciary. When the news is good you highlight the articles. When you disagree, it's some kind of conspiracy by the opposition and foreign press. Yup, some newspaper in some other country, by entering a paragraph in the end of an articles has some kind of secret agenda to destabilise Malaysia. Everyone is out to get Malaysia. Tun is lying, twisting and turning but many feudel blind loyalist cannot see it. Salleh highlighted a good point. 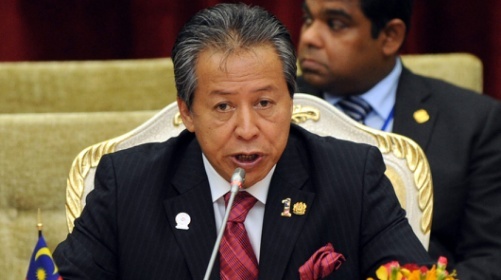 1MDB has exposed 15 major factual error that Tun made. Instead, he is giving excuses of asking for documentary evidence. JMD is spinning on minor issues but avoiding the major ones. He should stop being dishonest and deceitful too. Now he needs to rebut WSJ now! The whole Malaysia is being fooled by 1 person.....the truth will be soon prevailed. If we have a good upbringing for sure we will be able to differentiate between the good and the evil. AFTER the crime, use religion to smother truth.